Use your Rewards Membership card and enjoy instant savings at Boesmanland Plaaskombuis. Rewards cardholders must collect their discount voucher at the e-host, at Mykonos Casino. 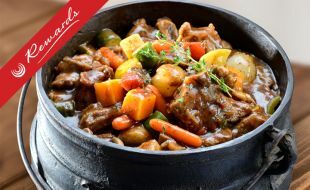 Boesmanland Plaaskombuis is a place where everyone meets for delicious traditional South African meals, seafood and Boerekos with a difference. Join the team of Boesmanland for a buffet eating experience to match the wonderful views of the Langebaan Lagoon. Open from Monday until Sunday. Bookings essential: Call us on +27 22 772 1564 or +27 82 773 0646. The Reward Limited Offer is only valid to Mykonos Rewards cardholders. The cardholder must present his/her valid Rewards card in person when paying the meal to qualify for the discount. The Rewards Limited Offer cannot be combined with any other discount, voucher, special offer or promotion, including but not limited to pensioners discounts. This Offer excludes public holidays, and special functions. The Rewards Limited Offer cannot be sold or transferred. The Discount offer is only for the cardholder, on meals only.